CCHS has published a book which describes the research findings of our Heritage Lottery Fund project. 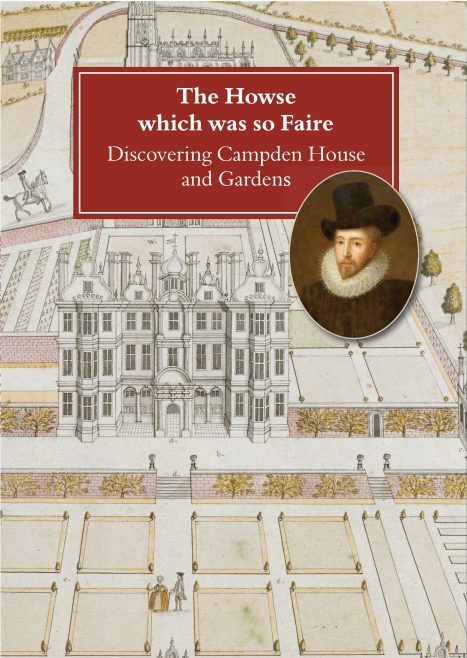 The book includes a biography of Sir Baptist Hicks, the immensely wealthy mercer and moneylender who built the house and created the formal gardens and parc. There is a curiosity about the site of Campden House, its association with the Civil War and, later, the disappearance of William Harrison – the so-called ‘Campden Wonder’. The challenge is that the house, although undoubtedly very special, existed for just three decades, being burnt down in 1645. There is little reliable evidence of what it really looked like and virtually nothing of the house and its spectacular gardens left apart from the beautiful Banqueting Houses. Tantalising clues remain, but of the house itself only a small fragment of ruined wall remains. CCHS turned detective to recreate how this magnificent house would have looked, its extensive formal gardens, the lavish interiors and its impact on the town of Chipping Campden. Much was also discovered about Baptist Hicks himself, his family connections, his relationship with his fellow merchants and the Court and the extent of his moneylending dealings. By a combination of archival research, local knowledge and practical investigation of the site, including a geophysical survey, we resurrected the ‘great burnt howse’ which has been lost for 400 years.